Bundner Oberland (also known as Bunder Oberlanderschaf, Grisons, or Graubunden) sheep are from Switzerland. They are found in white, brown, or silver-grey. Their head is slender and bare. 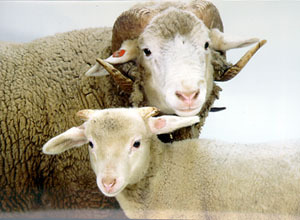 Rams have substantial horns while ewes have small horns or are polled (hornless). Both sexes display rather primitive behavior. Multiple births are common. When mature, rams weigh on average 72 kg (159 lb) and ewes 50 kg (110 lb). After reaching maturity, rams grow to 72 cm (28 in) and ewes 68 cm (27 in) at the withers. In 2007, there were less than 1,100 but their population is increasing and are used primarily for vegetation management.